Consoles and PCs have traditionally been like oil and water. Consoles are locked-down devices that prevent you from tampering with their hardware and software, while PCs invite users to modify those aspects as much as they like. This dynamic is changing, though. With the launch of Windows 8 and its Microsoft-controlled Windows Store, PCs are becoming more closed and console-like – much to the dismay of Valve, Blizzard, and famed Minecraft developer Notch. In response, traditional PCs are preparing to fight consoles on their own turf, pushing into the living room with the Steambox and even more open PC-like devices like the Android-powered Ouya console. Microsoft’s Windows 8 served as the catalyst that shocked Valve into action. Valve was likely working on Steam for Linux for a long time – but Valve’s unconventional management structure, where employees work on whatever they feel like working on, meant that it wasn’t a priority. Something changed with the launch of Windows 8. Gabe Newell, co-founder and managing director of Valve, publicly spoke out against Windows 8, calling it a “catastrophe for everyone in the PC space.” Microsoft’s Windows 8 appeared to be the start of a more closed Windows environment. Apple already prevents users from installing software outside of its own software store, meaning third-party software stores, like Steam, are not allowed. All software for iOS devices must go through Apple’s app store and play by Apple’s rules (unless you jailbreak). Just like the Steam store can never run on Apple’s iOS, Steam can never run on Windows RT. Will Steam be blocked in a future version of Windows? It’s possible, and that’s what scares Valve. Inside Valve, it was all hands on deck. Newell began considering Steam for Linux a high priority and Valve began hiring experienced Linux developers. Steam for Linux was now really on its way. After developing and launching a console-like “big-picture mode” for use on televisions, Valve has now confirmed plans to release a Steambox console of its own design. Valve plans to “unify” the living room and the traditional PC. This means a more console-like PC in the living room will compete with the Wii U, Xbox, and PlayStation on their own turf. More interestingly, Valve is taking a page out of Microsoft’s old playbook. Third parties will be able to develop their own console-like PCs that come pre-installed with Steam. In addition to Valve’s own console, you’ll likely see Steamboxes from many other manufacturers. You could even build a gaming PC, hook it up to your TV, and plug in an Xbox 360 controller to get the Steambox experience today. Valve wasn’t the first to come up with the idea of a more open, PC-like console. The aforementioned Ouya will offer more open software and even PC-style upgradable hardware, and its massively successful Kickstarter campaign demonstrated that gamers still care about these things. Of course, since it’s an Android-based console, the Ouya won’t run traditional PC games. Still, PC games on the Ouya may be closer than we think with cloud-streaming services like OnLive onboard. The success of the Android Humble Bundles (a bundle of three or four games for Android-based mobile devices and PCs) also shows that the same games can be made to work on Android, Windows, Mac, and Linux. If Valve were playing it safe, the Steambox would run Windows so it could take advantage of Steam’s massive catalog of Windows games. 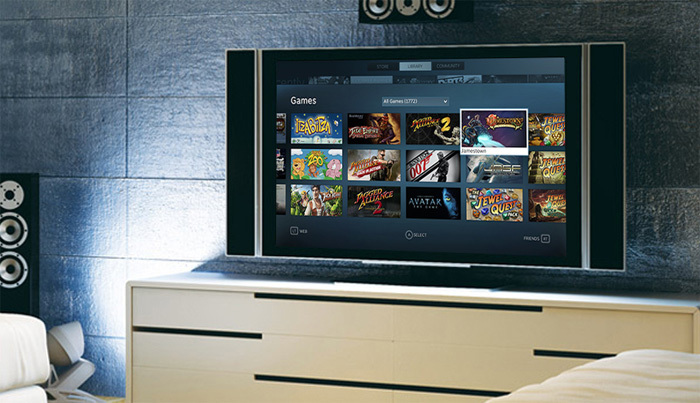 However, there are strong indications that the Steambox could be based on Linux. Steam for Linux is still in beta (in fact, it’s now in an open beta that anyone can join), yet the Steam for Linux store is now prominently featured on Steam’s home page, leaving the Mac OS X store buried at the bottom of the Games menu. Though Steam for Linux is still in beta, it already looks more important to Valve than Steam for Mac. Valve may be using Steam for Linux as a beta test for its console, which could run Steam on top of Linux. This isn’t as far-fetched as it might seem, since Google’s Android and Chrome OS both run on top of Linux. The Google Chrome browser came to Linux before Chrome OS was created, which gave Google time to work on the software that would become its new OS. Either way, we’ll likely see third-party Steamboxes that run Windows. Of course, you could also build your own. Even if Valve’s Steambox runs Windows, Valve is grooming Linux to be a credible alternative if it needs to make the leap. Valve is likely doing much more than simply porting Steam to Linux. If it can spur enough developers over to Linux, the open-source OS would become a viable desktop option for many PC gamers, too. But it may not be the traditional Linux on the desktop that the Linux geeks were waiting for. Steam already offers software in its store, including programs for budgeting and photo editing. As the Steam software store continues to expand, we’re seeing more pieces of the puzzle for a new platform fall into place. Valve could release a Steam operating system that hides Linux under the hood like Chrome OS and Android do. We might one day find ourselves choosing between PCs running Steam OS and PCs running Windows – each with their own, mutually exclusive app stores. In an era when Amazon is rumored to be making a smartphone compatible with its Android App Store, and Microsoft is baking its own app store deeply into Windows, walled gardens look like the future. Perhaps it’s only logical that Valve would expand Steam into its own operating system and device ecosystem. Linux gives Steam a platform not beholden to Microsoft or Apple. For Valve, Steam on Linux and the Steambox are the start of figuring this out. PCs running a “Steam OS” brand of Linux may be the next part. One thing’s for sure: it’s going to be an interesting few years for PCs and gaming.